A very good example of the Carl Zeiss jug handle microscope with nosepiece, stand 1B. The microscope is signed Carl Zeiss Jena and numbered 67962 which I think refers to production year 1916-1917. The microscope is in splendid condition and functions very smoothly. It can be stored in its mahogany case and is complete with the following apochromatic objectives: 2 mm, 3 mm, 8 mm, 16 mm with cannisters and the following compensated oculars: 2, 4, 6, 8, 12, 18. All can be placed in the mahogany box with nickel handle, lock and key. 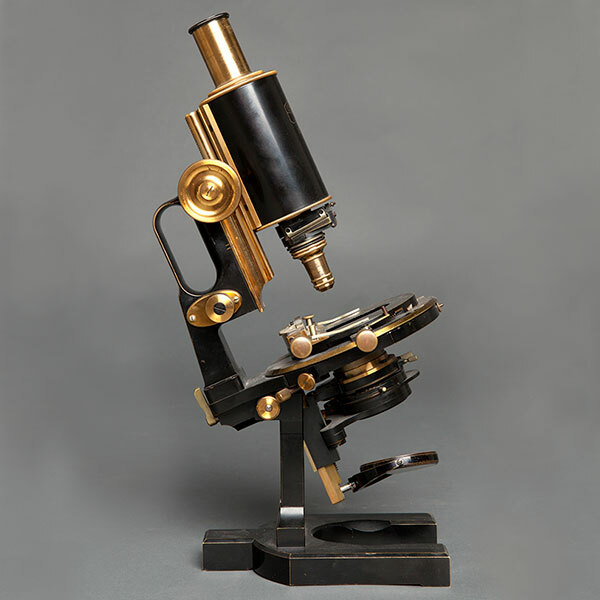 The brass black lacquered microscope is fitted with a circular rotating stage which, in turn, is fitted with a standard X-Y mechanical slide holder. The substage consists of a rack and pinion focusing Abbe condenser with swing-away iris diaphragm and condenser. The microscope is in very good condition, mechanical and optical.